Snowplumes: Colourful Creatures of Mydenahalli..! The very Intention of going to Maidenahalli Reserve to Photograph Black bucks was not fruitful inspite of long wait.Disappointed we were about leave in the evening. At the outer fringes of park to our dismay we were blessed to sight a pair of Chameleons in the bushes.We were mesmerised by the colour and the movement of these tiny creatures.My friend resident of Tumkur and a frequent visitor here told that he was sighting these creatures for the first time. The Indian Chameleon, locally in Kannada is known as Usaravalli or Gosumbe and is scientifically referred as Chamaeleo Zeylanicus. 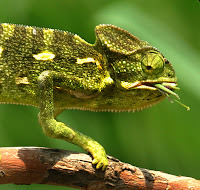 This species of chameleon is found across Indian Peninsula, Sri Lanka, and other parts of South Asia.Like other chameleons, this species has a long tongue, feet that are shaped into bifid claspers, a prehensile tail, independent eye movement and the ability to change skin colour. They make a robotic movement with a bobbing or swaying and are usually arboreal. The ability to change colours has made these lizards famous. Strangely, they do not choose the background colour and may not even be able to perceive colour differences. They are usually in shades of green or brown or with bands. They are cold blooded and live around water bodies.They can change colour rapidly and the primary purpose of colour change is for communication with other chameleons and for controlling body temperature by changing to dark colours to absorb heat. Changing the skin colour is an expression of the physical and physiological condition of the lizard too. If they are fearful or territorial, their emotions will evoke a particular color/pattern.Though many lizards can change colour, chameleons have made an art, and we see them go from brilliant yellow through shades of green and brown, all the way to dark purple. The term ‘chameleon’ is a combination of two Greek words, ‘Chamai’, meaning ‘on the ground/earth’ and Leon, meaning ‘lion’. Thus, ‘chameleon’ means ‘Earth lion’. The foot structure, eyes and tongue of all the chameleons are the same. The body of the chameleon lizard is covered with granular scales and measures upto 37 cm in length. They have specialized zygodactyl foot, on each foot the five toes are fused into a group of two and a group of three, giving the foot a superb gripping on twings, branches and have lifting like appearance. The prehensile tail resembling monkeys which can be twisted round twigs for extra security and balance (They are the only lizards which have such a tail). Their eyes are the most distinctive among the reptiles. The bulging eyes are nearly covered by eyelids The upper and lower eyelids are joined, with only a pinhole large enough for the pupil to see through. They can rotate and focus their eyes separately to observe two different objects simultaneously. It in effect gives them a full 360 degree arc of vision around their body. Inside of its mouth is pinkish white to dark pink in colour with teeth almost invisible and long tongue hidden deep inside. One of the most interesting and remarkable features of an Indian Chameleon is its extremely long tongue, which at times may project its body length also. The tongue is sticky at the end, which helps the reptile in catching prey. The moment the tongue of a chameleon hits a prey, it forms a small suction cup and draws the prey into the mouth. The long shaft of the tongue is banded with sheaths of muscles, which when suddenly contracted combine to instantly shoot out the tongue. The tip, which is relatively large and club shaped, is covered in a sticky secretion which instantly binds to the flies and other insects they mostly feed on. Thanks to a highly elastic fibrous base to the tongue it can be withdrawn equally fast. The whole action is over in a fraction of a second, faster than the eye can see. And it can be repeated immediately if desired. Chameleons do not have ears and vomeronasal (bone forming part of the middle partition of nose) organ. Chameleons have teeth to grasp onto food. Their teeth are also used to help them crush and kill their food. They may chew or swallow their food whole. They can also use their teeth for tearing chunks off and then swallow. Some chameleons hold the dead prey in their mouth for several moments before swallowing it. Prey is generally stalked with slow deliberate movements until in range, or else snatched out of mid air. Occasionally they will increase their striking range a bit further when stalking by supporting themselves on their hind legs and tail, to reach out with the full upper body. Spotting of prey is facilitated by independently swiveling eyes, the eyelids of which are fused into a single turret. Almost like circular fold leaving only the pupil visible in the centre. Each eye moves separately in its own socket, giving simultaneous near-300 deg vision. Once prey is sighted, however; they are both focused together for precise location and range finding, the latter being accompanied by a sideways rocking of the body. The breeding season of the chameleon falls around the month of October - to the end of winter season. They lay about 10 - 40 eggs at a time and the gestation period is 3 to 6 weeks giving birth to young babies 3 cm long. Before laying eggs, the female chameleon digs a hole in the ground, between 4 to 12 inches deep, and deposits her eggs in that hole. The eggs hatch after a period of 3 months. Like all other lizards, they do not look after their young. Chameleon survives on a diet of locusts, dragon flies, crickets, and other insects. They hear vibrations in the air, which help them to find food and stay safe from their enemies. They are almost deaf, but can hear tones and feel vibrations.To defend their territory during fights by making a unique hissing sound. These colurful creatures are mistaken to be poisonous and killed sometimes.These docile creatures are Non-venomous and Non - aggressive. However if bitten bleeding takes place due to sharp teeth and their is a possibility of infection. Hence basic treatment is necessary. It was almost getting dark and the little creatures dissapeared in the bushes one after the other in a stilted fashion after photo shoot. We felt that our visit to Sanctuary was Indeed worthwhile!